Sopchoppy, FL--Art Shelfer, Donald May, and Charlie Stines embarked on one of those spur-of-the-moment trips on February 19, 2005. The weather in south Georgia and north Florida had been exceptionally nice for February, and the canoes had not been wet since T hanksgiving. It was time to try some paddling. Art selected the location. After the trip, it was apparent why he is the Weatherman and not the Travel Agent! The trio met at the Shelfer house about nine and headed for the put-in on Forest Road 329. This is the same location where Art and Charlie had once before attempted to launch but only paddled a few hundred yards before determining the stream was impossible and camped at the put-in without ever canoeing the river. But Art thought the river was navigable this time. Whether he was right or wrong depends on one's perspective. Donald took his kayak, which proved to be a good choice once the blockages were encountered. Art and Charlie paired up in the Penobscot 17 (t he Gunn boat). After dropping off the boats at the put-in, Art and Donald took the Suburban Profane to the anticipated take-out at the city park in Sopchoppy. Because they relied on Donald's navigational skills, they first ended up in Crawfordville rather than in Sopchoppy, so it was around noon before they actually made it back to the put in Art's S-10, which Janice calls the SLT for sorry little truck. (Actually, sorry is not the adjective she uses) Charlie amused himself playing with his new major award, a new GPS, and by taking a long nap. Art also had a new GPS, so the two had some time learning the intricacies of more detailed navigational aids which mainly tend to slow the trip. Charlie fell in the river loading the canoes, but only wetted himself about to the knees. Once paddling began, it was clear that this would be no easy trip. The Fellow Travelers were loaded unbelievably lightly--no cots, roll-a-tables, lanterns, only a griddle and c offee pot for cooking, and small tents. But there was that heavy ice chest. It was less than a quarter-mile to the first of what seemed hundreds of pull-overs. A few could be floated over, a few could be floated over, and there were some places where the boats could be dragged over the sandy bottom of the shallow river. But there were lots of places where the canoes had to be physically lifted over logs totally blocking the flow. Donald could take his kayak with one hand and get over them, but Art and Charlie exhausted themselves lifting the Gunn boat over logs. A chain saw would have been the ideal major award. Fortunatlely, the water was not especially cold. Despite the obstructions, the trip was great. The Sopchoppy begins as a very small stream, and for the first day was seldom two feet deep. 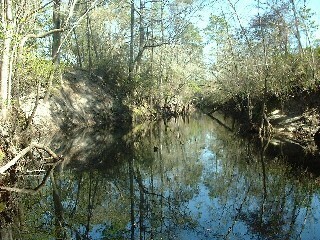 It winds through a ravine with high banks. Sometimes the banks are of clay, and other times they are limestone. Ferns and mosses cover the banks. The Sopchoppy probably has the largest cypress trees the group has encountered. After canoeing for about three hours, the paddlers stopped for a lunch break. By GPS the distance was something over a mile from put-in. No speed records were being set. Wildlife the first day was scant, consisting mainly of squirrels and songbirds. As the trip progressed, some nice sandbars suitable for camping appeared. 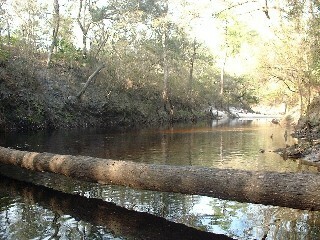 The confluence of Monkey Creek added a little water to the little stream. But the King insisted on trying to make it past the Oak Park bridge before pitching camp. The bridge is supposed to be five miles below the FR 329 bridge, and it was finally seen around five. Shortly after that, Donald found a suitable campsite on a high bank. The GPS reminded everyone that it was only three miles from the put-in. 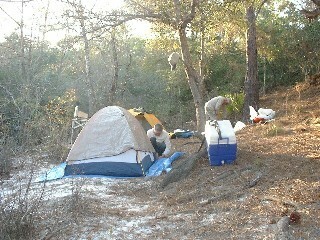 This site required carrying the gear up a steep bank, but there was about room for the three tents. Donald built a nice little fire. Everyone set up the tents, and Art cooked what he called Poor Man's Philly Steak Sandwiches. Only the griddle was used, and the food was good. Dessert was a box of Cracker Jacks and Donald's dried pineapple chunks. The sky was clear, and the moon was bright. The temperature was supposed to get down to 43 degrees, and it probably got that cold. But all three men had warm sleeping bags, and no one was cold. The occasional hoot of an owl was about the only sound to be heard. Everyone slept until daylight. Charlie got up and made a pot of coffee, then built a fire. It was a pleasant outing in spite of the cool morning. The breakfast was a poor imitation of Roy's Egg McMoyes--grilled onions, cheese, egg, and ham on an English muffin. Donald ate two. It was a good breakfast even if falling somewhat short of the Moye standard. Earnest paddling was underway before nine. It was only a short distance to the first of many more pull-overs. The second day the paddlers were entertained by many ducks as well as the squirrels and songbirds. The scenery remained outstanding. The river got a little wider and deeper. The next landmark was the Mt. Beeser bridge, which was five miles beyond the Oak Park bridge. The Forest Service has built a new bridge there. It was a welcome sight and reminded the fellows that things were moving a little faster. Donald was in the lead and spotted a doe and a buck deer. Although the obstructions were still there, they were less frequent. However, due to the increasing depth of the river, some were harder to negotiate. It became obvious that the right bank of the river was no longer in the Appalachicola National Forest because houses were found. Some were shacks and others were quite elaborate. A pair of large hawks were spotted, and they led the paddlers for a considerable distance by flying off as the boats approached but waiting a short distance ahead for further guide the group. Finally they tired of the company and flew off into the woods. Art and Charlie had regained the lead, and they spotted a four foot alligator sunning on the bank. The paddlers approached for pictures, and the alligator seemed oblivious to their presence. Charlie took pictures, and Art nudged the canoe closer. Finally they decided the animal was dead. So Art pulled the canoe really close. At that time the gator revived, and it was a bit of an uncomfortable feeling. But he lazily slipped into the river and swam away. The FR 375 bridge was finally reached. It was again five river miles below the Mt. Beeser bridge. The river had become rather wide and deep, and it was easy canoeing. 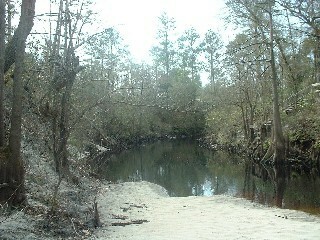 The development along both sides the river detracted from the wilderness experience. From there it was about four miles to the city park and the take-out. The trio arrived around four, loaded the boats, and returned to the put-in to pick up Art's SLT. If the trip was nineteen miles, as the canoe guide say, at least twelve hours were spent actually paddling. But it was a worthwhile trip.